On 7 September, thousands of schools across Australia participated in an event aimed at increasing the amount of time students spend playing outdoors. 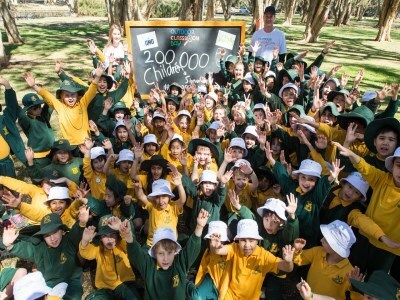 More than 200,000 kids from almost 2,000 primary and kindergarten schools took part in the Australia-first event, dubbed Outdoor Classroom Day. The national campaign was organised by Omo and by Nature Play, a not-for-profit association which aims to increase the time children spend in unstructured play outdoors and in nature. Research has shown that an overwhelming number of Australian children (85% ) spend less than two hours of play outside - more than a third (36%) less than previous generations. Lessons include a range of creative and fun activities that will harness important skills such as independence, adaptability, resilience, creativity and problem solving that can only be learned outside the classroom. Studies show that outdoor learning equips children with the fundamental ‘success skills’ to overcome and adapt to challenges. This teaches children critical life skills such as resilience, teamwork and creativity, but is central to children’s enjoyment of a happy and healthy childhood. One driving factor behind the campaign is to ensure that children do not spend too much time in front of screens. A survey last year found that three-in-five children exceed the recommended amount of screen time, which is one hour a day for children aged two to five and two hours a day for five to 18-year-olds. Recent studies have also shown that Australian kids are spending 20% of their time using screens during the week and 30% on weekends. Griffin Longley, Nature Play CEO, told The Educator that this proves there is a “clear imbalance” between outdoor playing and learning and indoor screen time. “[Digital devices] can be great tools for learning. However, there is a problem when screen use replaces other fundamentally important ways of learning and developing into a capable, creative, and socially adjusted human being,” Longley said. Longley said an increasing number of educators are seeing the benefits of getting students outdoors to engage in playful learning, and looking for ways to do it within the context of the curriculum. “One of the powerful elements of Outdoor Classroom Day is that it isn’t just a message, it is a resource. Educators can download lesson plans, case studies, risk/benefit assessment plans and a suite of helpful resources,” Longley said.